Keeping your Apple Watch powered on the go isn’t as easy as you’d think—especially since it can only be charged via Apple’s special magnetic charging puck. Sure, you can plug your charging cable into a regular portable battery, but do you really want to tote around a tangled, 2-meter-long charging cable? I didn’t think so. This charging conundrum—coupled with the fact that the Watch’s “all-day battery” isn’t quite as all-day as Apple would like you to believe—has accessories companies scrambling for the perfect solution: portable wireless Apple Watch chargers. We tested four of these power banks, which are formulated specifically for the Apple Watch and its 2-meter-long charging cable, to see which ones will make your life easier and more powerful. ClearGrass’ Amber watchcase power bank has raised hundreds of thousands of dollars on both Kickstarter and Indiegogo, and the reason why is obvious: This portable charging case is functional, beautiful, and perfectly in line with Apple’s minimalist aesthetic. The Amber is currently available via pre-order, and will retail for $99. The case—a watch case/power bank—is made of anodized aluminum and plastic, and comes in four colors to match your Watch (silver, gold, rose gold, and space gray). The Amber measures 4x4 inches with rounded corners and is 1.75 inches thick, and weighs just shy of 10 ounces. It’s a little clunky to stash in a purse or a briefcase, but it’s certainly small enough to tuck away in your suitcase for easy travel. The top of the case has a single button that, when pressed, activates charging and displays the power bank’s current charge level (in five pinprick LEDs). The back of the case has two ports—a microUSB port for charging the internal battery, as well as a regular USB port that allows you to charge a non-Watch device (such as an iPhone) simultaneously. The Amber opens with a hidden plastic hinge to reveal its semi-complex charging setup. Like the other portable chargers we tested, the Amber is merely the power bank and does not include charging hardware—in order to use the Amber, you’ll need to install your own magnetic charging cable. Installing the cable is fairly easy—just remove the plastic cover and the plastic spool, plug your cable into the hidden USB port inside the spool, and wind your cable tightly around it. The Amber can accommodate both the 1-meter and the 2-meter charging cables (though you’ll need to wind more precisely to make the 2-meter cable fit). Once the cable is fully wound, place the charging puck in the circular indentation at the front of the spool and snap the spool into place. To charge your Watch, place it against the charging puck inside the Amber and press the button on the top of the case to activate charging. The Amber comes with a companion app that will notify you when your Watch is fully charged (the app can also be used to locate your Amber via phone). When your Watch is fully charged, the Amber will automatically stop charging to save its internal battery life. The Amber is both beautiful and functional, and it works exactly as advertised—as both a portable battery and a protective case for your Watch. (It’s also the only portable charger I tested that automatically stops charging once your Watch hits 100 percent battery life, too.) The Amber packs a 3800 mAh internal battery, which should give you at least seven full Watch charges. Boostcase is known for its fashion-forward tech accessories, and the Boostcase Bloc ($79.95 MSRP)—a wireless Apple Watch dock with a built-in 2,000 mAh battery—is no exception. The Bloc, which is made from premium materials and features exquisitely precise craftsmanship, is actually designed as a stylish, wireless desk accessory—not a portable charger. But thanks to its built-in battery, it can be used as both. The Bloc comes in three finishes: silver aluminum, space gray aluminum, and natural bamboo. This wireless charging dock is a simple block of metal or wood that measures 2.1 inches wide by 10 inches long, is just over half an inch thick, and weighs approximately 8 ounces. The center of the Bloc has a round cut-out for your magnetic charging puck (your Watch simply rests atop the Bloc while charging). The Bloc is a dock and a portable battery in one, but to use it you will need to install your own magnetic charging cable. Installation is a little tricky because the Bloc is so precisely engineered—but it’s worth it. To install your cable, you’ll first need to seat your charging puck. The Bloc comes with two small silicone rings that fit around the puck (one fits the metal puck and one fits the plastic puck). Place the appropriate silicone ring around the puck and squeeze the puck into the round cut-out. This may take a few tries, but your puck should sit perfectly flush with the Bloc’s surface. Once you have your charging puck seated in the Bloc, you can flip the device over and start carefully threading your cable along the precision-cut grooves. The grooves are exactly long enough to accommodate both the 1-meter and the 2-meter charging cables (for the 2-meter cable you’ll simply thread through the grooves twice). You can then plug your cable into the Bloc’s battery and start charging. The back of the battery has a microUSB port and three LEDs that indicate the current charge level. To see the current charge level, draw your finger along the battery’s touch-sensitive panel. The Bloc is a beautiful, elegant desktop accessory, but you’ll have some trouble using it as a portable charger because the Watch needs to lie flat on top of it—it’s not a protective case that you can close and toss into your bag. It is very slim, lightweight, and portable, however, so as long as you have a flat surface you can keep your Watch charged on the go. The built-in battery will give you at least four full Watch charges, and the battery itself can be removed if you’d like to charge a different device (such as an iPhone). Nomad’s Pod for Apple Watch ($59.95 MSRP, same price on Amazon) is a compact wireless Apple Watch charger with a built-in 1800 mAh battery. The Pod is designed to be a travel companion—a small, portable battery that will keep you juiced up through a “long weekend” (you should get at least three full charges out of the Pod). The Pod is the smallest and the lightest of the portable chargers we tested: It measures 3 inches in diameter, is 1 inch thick, and weighs 4.7 ounces. It’s made of plastic and anodized aluminum, and comes in two finishes (silver and space gray). The Pod is approximately the same size and shape as a standard-issue hockey puck, with a hole in the top for your magnetic charging puck and a bottom that’s lined with rubbery non-slip material. Like the other portable chargers we tested, the Pod is just a battery and requires you to install your own magnetic charging cable in order for it to be useful. The Pod accommodates both the 1-meter and the 2-meter charging cable, though the 2-meter charging cable is a pretty tight fit. To install the charging cable, you will need to remove the Pod’s aluminum cover, which is attached with magnets. Inside, you’ll see a black plastic cable spool, a USB port, and a place to put the charging puck. First, you’ll plug your cable into the USB port and then you’ll wrap the cable around the spool, trying to keep it as snugly wound as possible. When you run out of cable you can place the charging puck in its seat and replace the aluminum cover. You may have to wrap the cable a couple of times to get the cable to fit. On the side of the Pod there’s a microUSB port, a small power button, and four LEDs that indicate the Pod’s current charge status. To charge your Watch, simply place it atop the Pod and press the power button. The Pod will not stop charging once your Watch is fully charged, so you’ll want to remove it as soon as it hits 100 percent. The Pod is a handy portable charger that can keep your Watch powered up throughout the day. While you can get at least three full charges out of the Pod’s modest battery, the fact that it doesn’t shut off after your Watch is done charging means you may get less. Like the Boostcase Bloc, the Pod requires a flat surface for charging (you can’t just toss it in your bag and charge on the go). But if portability and size are a concern, the Pod is the charger for you. The Amber isn’t the only portable Apple Watch charger with crowdfunding prowess—Unity’s Pocket has also received hundreds of thousands of dollars from both Kickstarter and Indiegogo. The Pocket, which is currently available for pre-order and will retail for $105, is billed as a 6-in-1 charging dock—where “6-in-1” is somewhat liberally defined. (Three of the Pocket’s six functions involve its use as a portable battery.) The Pocket is a charging dock and a protective Watch case, and it features a modular design that seems a bit overly complicated. The Pocket is made of plastic and silicone with aluminum mesh accents. It’s a rectangular tower that measures 2.5 inches wide by 3.75 inches long, and is 4 inches tall. For maximum versatility, the Pocket is modular and comes apart into five different pieces. It also ships with an additional silicone piece that helps turn the lid into a charging dock for your iPhone (more on this later). There are three main sections to the Pocket: The top piece (the lid), the center piece (the cable management piece), and the bottom piece (the battery). The lid is made of hard plastic and has Unity’s logo stamped across it. Remove the lid and turn it upside down, and you’ll see a piece of silicone inside that acts as a stand for your iPhone. The separate piece of silicone that ships with the Pocket can be placed on top of this piece of silicone to make an elevated iPhone dock (with extra space underneath it to accommodate a charging cable). Noble idea, but who’s going to carry an extra piece of silicone around with them? Not me. The center piece of the Pocket, or the cable management piece, is where you’ll place your magnetic charging cable. This piece comes apart into three separate pieces—the cover, which is accented with aluminum mesh that’s only half-attached to the body, the cable spool, and the dock for the charging puck. The cable spool is large and hollow (inside the cable spool is where your Watch will be stored), and fits both the 1-meter and the 2-meter charging cables. The dock for the charging puck is a small dome-shaped piece of silicone that rests atop the spool’s hollow interior. It’s not exactly precise, but it is flexible since it’s not attached to anything else. Once you have your charging cable wound around the spool and the charging puck seated in the dock, you’ll need to plug the cable into the bottom piece of the Pocket—the battery. The battery has a microUSB port and a regular USB port, so you can charge non-Watch devices (such as an iPhone) simultaneously. 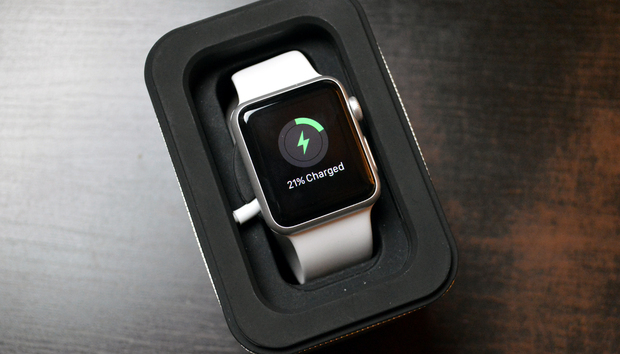 It also has a power button and five LEDs that indicate charge status on the opposite side. The Unity Pocket is an interesting concept—its modular design allows you to use it as many things, including a separate portable battery (you can remove the battery section), an iPhone dock, and a Watch charger—but this product seems unfinished. It’s certainly not as polished as the Amber charging case, nor is it as precisely manufactured as the Bloc. When your Watch is resting atop the precariously-placed charging puck, you should be able to place the lid piece over it, but I found this to be difficult because the silicone piece inside the lid kept pressing on my Watch’s face. The Pocket seems to be trying to do too much—an iPhone charging dock is a nice feature, but not at the expense of the Watch charging case. It’s also rather large and clunky (and the pieces come apart quite easily) to be ported around in a purse or a bag. The good news is that the Pocket does have the largest battery—4,200 mAh—of the chargers I tested. This will get you 10 full Watch charges, so you can go a whole week without plugging in.